I find it amusing how frustrated people are with President Obama. It is a classic example of how one’s expectations are the seeds of one’s disappointments. It also shows people’s lack of maturity. Maturity comes down to how gracefully I can accept a reality that doesn’t match my expectations. Children get their hopes up for this or that, and when life goes the other way they have tantrums — they lack maturity. This is what we expect from children, but adults? This shows how little difference there is between children and adults. In truth, we’re just big children struggling to be adults. I say, it takes more than a lifetime to reach true adulthood. The public’s expectation of social change was terribly naive and doomed from the start. Society is like a huge ship; ‘Captain Inertia’ is at the helm. No wonder we say ‘the ship of state’. Turning a large ship around is a slow gradual process, as is social change. Seen up close, this ‘ship of state’ is more an illusion than reality. The so-called state is really a horde of people, just as a beehive is really a horde of bees. The state is the people; the people are the state, and change is glacial. Speaking of glacial, when the ship hits an iceberg, change is sudden. The ship sinks. I suppose the parallel to this in society is revolution. When the ‘horde’ changes course, the state must follow. 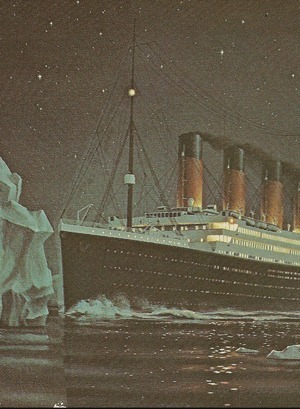 The events of the last few years sure look like the ‘great ship of state’ has hit an iceberg. Revolution is in the air. Obama promised a civilized revolution… “change we can believe in”. Now the Tea Party promises a more radical revolution… “throw the bums out”. Then of course, there is the economic revolution that hit a few years ago. All this looks to me like natural and inevitable consequence of the modern ‘get it now; pay for it later’ approach to life. The ‘horde’ has come to its dead end and is in desperate need of a course correction. The ‘get it now; pay for it later’ approach to life flies in the face of Nature’s most basic tenant: living things work and earn their way for what they get. Struggle followed by reward. Modern civilization has managed to ‘outwit’ natural law with its ‘get first; pay later’ innovation. As chapter 16 warns, Woe to him who willfully innovates, while ignorant of the constant. Nature rules in the end. Consequences come due – unpleasant, unexpected, unwanted, yet as predictable as night and day to anyone who has a proper sense of awe, as chapter 72 notes… If not, then some awful visitation will descend upon them. Mistake in last response. I meant to say “We do not utilize systems thinking properly”. I did not know how to edit my comments after I submitted them. Total agreement with you, and it does not take a Rocket Scientist to see that the Republicans in majority are not going to accomplish anything either, the time delays(inertia) involved in these social systems are extremely long, and at times unpredictable-being human,and the next party will just add to the stability problems. As a society we still do not understand how to solve problems as a systems approach. We do utilize systems thinking properly. Very sad situation, our Great Grand Children will pay dearly for our ignorance and condemn us for our stupidity.